We can provide Profit Corporation Kits, Nonprofit Corporation Kits, Limited Liability Company (LLC) Kits, Professional Limited Liability Company Kits, and Professional Association PC Corporate Kits with corresponding minutes and bylaws. 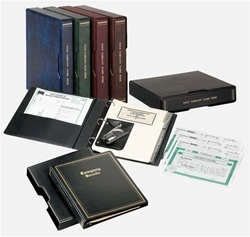 Kits consist of many things that will help you comply with state rules and regulations regarding documentation and record keeping. The 20 Personalized Numbered Certificates contain your company name and state of incorporation and are printed on the finest security paper available. In addition, there is a custom finished metal seal with your company name, state and year of formation to be used to make an official impression identifying the company on official documents. Our kits are made of high quality two-toned textured vinyl that is electronically sealed over a rigid board to ensure long life and durability. Each binder is detailed in gold. Top quality back-mounted three-ring mechanisms with double opening and closing boosters allow pages to lie flat and turn easily. Personalized Corporate Seal (finished to include your company name, state and year of incorporation), that can be stored inside the binder in its storage pouch.